Capital High School dance team coaches Jaci Gruhn (far left) and Jan Kiefer helped lead the Cougarettes to a first place finish in the ‘home’ routine and a superior trophy at the Universal Dance Association Regional Camp this past July. This performance qualified the team for a trip to the UDA nationals in Orlando, Fl., in February of 2014. It’s been nearly a decade since the Capital High School Dance Team traveled to take on the nations best. And thanks to hard work, talent, leadership and strong coaching, the Cougar Dance team will be traveling back to Orlando, FL this February for the Universal Dance Association (UDA) National Championship. Led by coaches Jan Kiefer and Jaci Grunh, the Cougarette’s qualified for nationals after a terrific performance at the UDA regional camp in July. The team placed first overall in “home routine” and received a Superior Trophy for their overall performance. Kiefer, who has coached the CHS dance team for over 17 years, knows that her current collection of girls is different than any other before them. Capital High School dance team coaches Jaci Gruhn (far left) and Jan Kiefer helped lead the Cougarettes to a first place finish in the ‘home’ routine and a superior trophy at the Universal Dance Association Regional Camp this past July. This performance qualified the team for a trip to the UDA nationals in Orlando, Fl, in February 2014. Qualifying for nationals requires pinpoint execution in a pressure filled environment. At the July camp, the CHS girls performed in front of a crowd of over 5,000 people, all with a trip to nationals on the line. Part of Gruhn and Kiefer’s job is keeping the girls emotionally capable to perform, a job they say is made easier by the members of the team. Along with coaching, and performances at CHS football and basketball games, the Cougarette’s spend hours working on their choreographed performances. Gruhn, who serves as the choreographer on the coaching staff, has already created a layout of the competition pom piece for nationals. Through the countless hours of practice, the routine will evolve through an experimental process of sorts. Both Kiefer and Gruhn noted that at nationals, the Cougarettes will compete against high school teams that have performed together since elementary school and enroll in specific performing arts schools to continue dance and drill. What makes the CHS team successful is the coach’s ability to work with girls who don’t come from a “traditional” dance background. Along with learning the routines from Gruhn and the drill/dance fundamentals from Kiefer, the Cougarettes must also undergo high level physical training throughout the year. This allows the team to be able to focus only on the routine during competitions and performances and not get slowed down by a lack of conditioning. Thanks to a special group of nine seniors, who comprise one-third of the 27 girl team, the two coaches have to worry little about the team slacking. With the influx of younger girls to the team, Kiefer will be going back to basics the first few weeks of practice. This also helps refresh the more experienced girls, to avoid becoming complacent. Over the next few months, the Capital High School dance team will prepare for the UDA Nationals by performing at CHS football home games and at regional/state competitions. The team has shown the ability to balance their time, as they were the 2A Academic State Champions last year. Throughout the football season, the team will perfect a new routine, for every home game. The team performs during half-time, considering these performances as the perfect tune-up for an event like nationals. Together, Gruhn and Kiefer have influenced the girls on matters away from the stage, as well. This past year, the Cougarettes were the Academic State Champions. The team achieved the highest GPA among all other 2A schools. The two coaches describe themselves as a ying and a yang, with their differing personalities and style of coaching creating a perfect balance. “If you look at our purses, mine is organized, everything has a place. That’s not the case for Jaci, and that’s where her creative genius comes from,” said Kiefer. Qualifying for nationals is hard enough, but organizing a cross country trip for 27 girls takes things to a whole new level. The Cougarette’s have hit the fundraising path hard. The team will also host a Junior Cougarettes Dance Clinic on Saturday, Sept. 21. Despite the challenges ahead, the coaches are thankful for the support they’ve already received from the school and the community. Equally as important is the support received from the families of team members. With all the perofrmances, fundraising and travel planning, the coaches must keep the girls focused on the present. 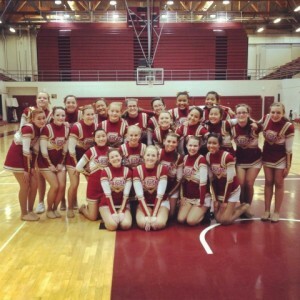 For more information on the CHS Cougarettes Dance Team, visit their website here. Follow the CHS Dance team on Facebook or Instagram.